The eNewsletter of District 1100. News and views around the District. Want something publicised send it to us. Ramping up and winding down! it is business as usual. With over 500 registered to attend it looks like being an outstanding success. We have got work to do with, The World's Greatest Meal to Help End Polio" as well since this is an ongoing project. If you or your club have not taken part then now is your chance. The funds being donated and or raised are certainly mounting up and at RIBI Assembly we reached over £700 in one evening. We then add £1,400 to that sum from the Bill and Melinda Gates Foundation match and we have £2,100, which is a sizeable sum by any standards. On a much more solemn note we as a District offer our condolences to the families of those who were killed and injured in the roadside bombing in North West Pakistan. Our fight to rid the world of polio must continue since if we give up now the lives of these aid workers would be in vain. It's incredible what Social Media can do. How the year is marching on, I can’t believe that this time last year we were in Torquay for our annual conference and this time next week we will be in Bournemouth and about halfway through this years. Just doesn’t seem possible. Congratulations to the D1100 eclub for getting coverage of the Worlds Greatest Meal to End Polio event at Uplands School, Swindon – this was run by the school Interact club. 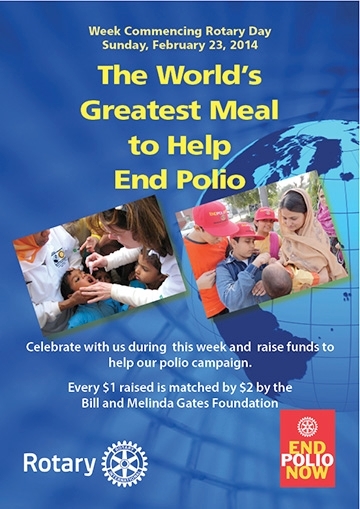 Talking of the Worlds Greatest Meal to End Polio, there have been a lot of events this week organised by clubs all over the District, please do not forget to let Susanna Rae know so that we get a correct figure of the funds raised and thank you for taking part. A reminder, there is only 4 weeks left to get your Presidential Citations to me, I need them by the 31st March – these are of course for the clubs not just the President, it is called a Presidential Citation as it is given to the clubs by the RI President each year. Your Editor was privileged to attend as incoming Editor of Rotary Today the World Magazine Press Seminar at the RI Headquarters in Evanston. Editors of magazines from almost every country were present and it was the first time the full translation suite was used. Emma Howell, Head of Marketing at RIBI and myself listened and contributed to discussions and presentations on many of the magazines produced by Rotary all over the world. This aligned with membership of the organisation and branding as well as marketing. Also an appointment to the RI advisory board on magazine editors. We were privileged to be sitting with the present RI President for dinner one evening and listening to him and his wife Jetta tell us of their travelling plans for the next few weeks was breathtaking. in the next few weeks he and Jetta will be visiting Rome and will have an audience with the Pope. Such is the status of the RI President. 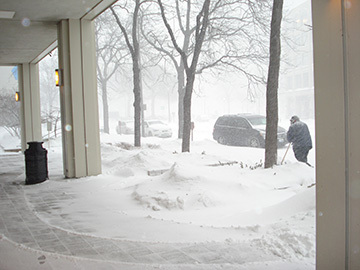 Whilst in Evanston we experienced almost the worse of the weather as can be seen by the picture above, this was taken outside RI HQ on our third day. The next day the snow melted, well almost. We met and had discussions with a number of RI HQ staff and their dedication to the work of Rotary is humbling. We then flew back to RIBI Assembly for the weekend. It was quite a busy week since your Editor went on to present to all service committees of RIBI as well as specific presentations to the Marketing PR and Communications chairs from the various districts. I've now just about come back down to earth for a breather. The eClub in the District continues to grow. We have news of one new member inducted this time and the induction was done by no less than RI President elect at the RIBI Assembly in Birmingham. Jacqui Horn the partner of District Governor nominee Tony Horn was inducted by Gary Huang. Membership continues to be a top priority for clubs as the RIBI region was one of the biggest losers of members over recent years. We lost 7,743 members in the period 2003 to 20013 a loss of 16% second after Japan. The biggest gains in members over that period were Taiwan at 49% and India 38%. The marketing campaign, "We're for Communities" is certainly bringing in the enquiries but turning the enquiries into members is proving more of a challenge. ...sent in the picture above of the club members with the children from Hop Skip and Jump at Severn Springs. The charity gives help and respite to families and children with learning disabilities. 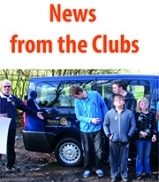 The club made a £5,000 contribution to the bus which will carry the Rotary emblem around the county for several years. We apologise to Sunrise but the picture had to be cropped and resized to enable it to fit into the space. Literacy is one of the Areas of Focus. 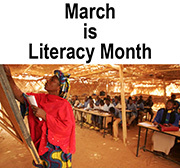 March has arrived and in the cycle of the Rotary theme months, March is Literacy Month. When the concept of theme months commenced back in 1983 literacy was considered so important that it was the theme to start the Rotary year and July was the dedicated month. Along the way, the penny dropped that there was rather a lot happening in July with changes of administration and new club Boards settling in. 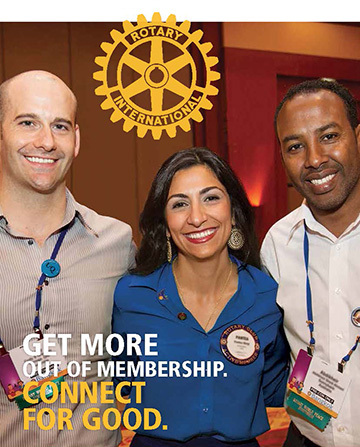 Literacy is not only a significant goal for Rotary but it is also a special goal for Rotary because we know that literacy is a key factor in overcoming poverty and all that goes with it. Rotary considers it to be so important that it is one of the 6 areas of focus for The Rotary Foundations Future Vision – basic education and literacy. 20, Hatherley Court Road, Cheltenham Glos GL51 3AG allan.berry@btconnect.com Did you get this eNewsletter from someone else? Do you want your own copy each time if so sign up by subscribing.